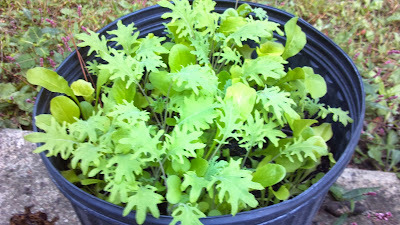 Pick the big lettuce leaves and more grow from the center. It has been three days since I shaved that first leg. Having a hairy left leg should bother me, but it doesn't. I'm going to blame it on the MS. It's hard to shave that second leg when your body is made of cement. So the rest of you need to pony up. With pictures. If you are growing the vegetable containers to improve your diet and reduce your grocery bill, I wish you'd send some pictures. The rest of the readers do too because they are tired of seeing the same pictures I took weeks ago. Lucky for them! I took some new ones! My sister followed the plan and beat the tar out of me. 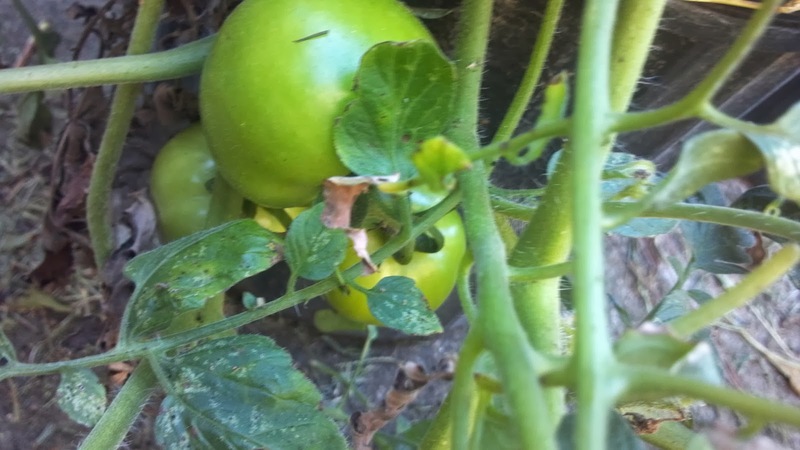 She got tomatoes! Peppers! She just planted the squash seeds. That you can tell all this stuff by our actions and there are all these hidden unconscious feelings that surface in our behavior? What would you infer about my sister and her love of squash? That she has none and she hates it? BING! BING! BING! Sometimes I wonder if my scepticism of psychology is misplaced. So here's the link to somebody else's container vegetables. I also finally fertilized the squash and replanted the lettuce. They look soooo much better. Now show us your stuff! VEGETABLE STUFF Don't be shy. I've seen worse, I promise. Hey! I don't "hate" squash. It's fine in small doses. The reason I have so many plants is because that's what came up. 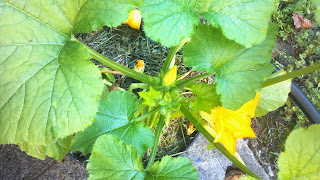 I planted equal numbers of yellow crookneck squash seeds as I did green pole bean seeds and English green peas seeds. One lone bean plant is making it, I never got even a sprout out of the peas, and well... tons of squash. They are thriving, btw. You want some when I finally get squash?